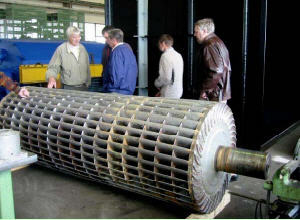 Hydropower › Small is Beautiful ! Fig. 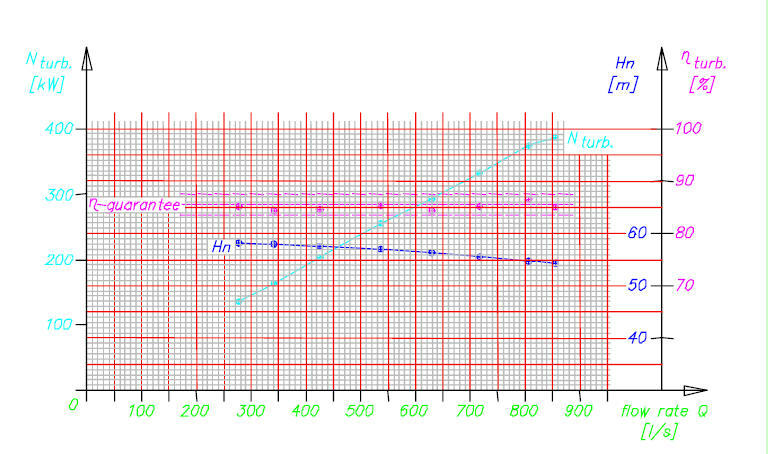 1: Schluchsee, H = 37,6 m; Q =4,68 m³/s; N = 1 442 kW; n = 214,3 r.p.m. You might ask: Why report on a mini hydropower station of less than 50 kW, even though OSSBERGER often installs plants with a capacity in the order of 1 MW? For example there is the Schluchsee Hydro station, which is one of the largest pumped storage plants in Germany with a 942 kW turbine located at the downstream basin. 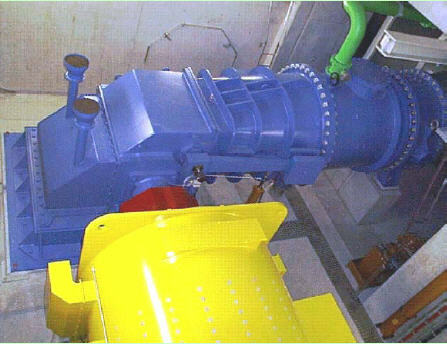 One OSSBERGER-Turbine recently manufactured, designed for a flow rate of 10 m³/s at 22,2 m head, with an output of 1 828 kW is installed in the Capital of Chile. Why then report on a mini hydro station and not on one of these much larger projects? The reasons for this are many and after I have explained further, you may agree. Let us consider the Sunny Brook Hydro story. Bruce Sloat – remember his name – started to look for alternative energy, after the Energy Crisis hit in 1978. He owns a farm with 280 acres in New England, U.S.A., which is situated on a mountain slope with hilly terrain, through which a small creek flows. 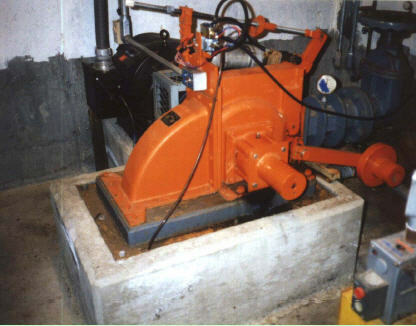 He built a small hydropower station with an OSSBERGER™ Turbine. This was our company’s first export of hydro equipment to the U.S.A. Knowing for how long OSSBERGER has been in hydro business, it makes one wonder, why it took such a long time for our turbine system, which proved so successful throughout the world, finally reached the shores of the Unites States. There are good reasons for this. Even today there are still people trying to copy our turbine system. In 1945 it was a US Soldier who had taken the design drawings from the factory. 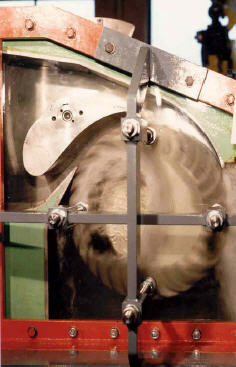 Using this documentation many efforts were tried to imitate the OSSBERGER™ Turbine concept in the US. 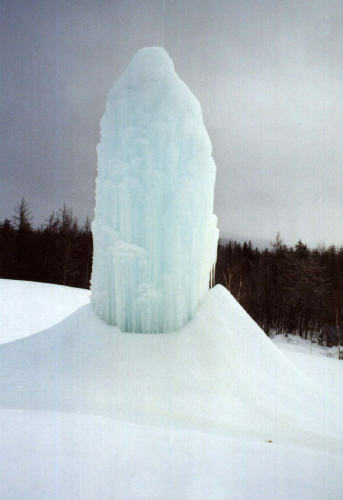 But the outcome was mostly unsuccessful and the good reputation of crossflow turbines were seriously damaged, and misunderstood. Nowadays we continue to experience the same problem with numerous new imitators, even in Europe. 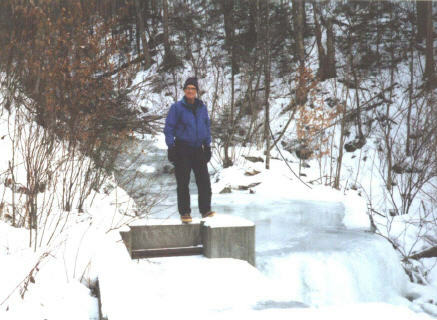 Bruce Sloat’s early vision to build his own small hydropower station on his farm was constructed. The following year, an extraordinarily hard winter hit New England, proving Sloat right as he had sufficient energy to get electric power to his farm and for his home. This created much local interest at that time, since downed power lines in large parts of the state seriously disrupted power supplies for many; but not for Sloat. Subsequently a flood of inquiries was received for similar hydro schemes. One newspaper heading read: “Sunny Brook Hydro: One man’s answer to the energy crisis“. Bruce Sloat is an interesting character, who knows how to inspire others. To understand his behaviour I need to cite a statement made by our former U.S. Representative: “He gets people excited“. Sloat’s small hydro station was the corner stone which launched the installation of 40 more hydro plants ranging from 5 kW to 1.2 MW and this is one of the reasons why this first unit has made such an impact. Even more interesting is to learn about this plant’s economic success, which directly links to this story. At the time of the investment and during some following years, the average purchase price for power the local Utility paid, was up to € 0,089/kWh. The investment couldn’t have been made at a better time. 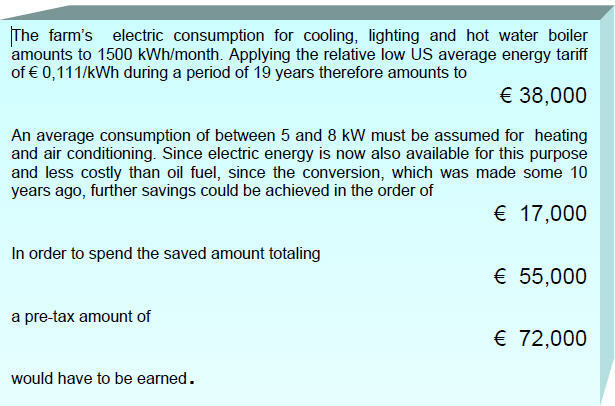 But the price rate decreased to only € 0,022/kWh. Presently the rates are on an increase again, and are likely to continue, especially with the premium renewable energy sources attract. The Electric Utility performs daily readings of the power meter, using a modem installed in the powerhouse. Throughout the day the rate varies continuously. 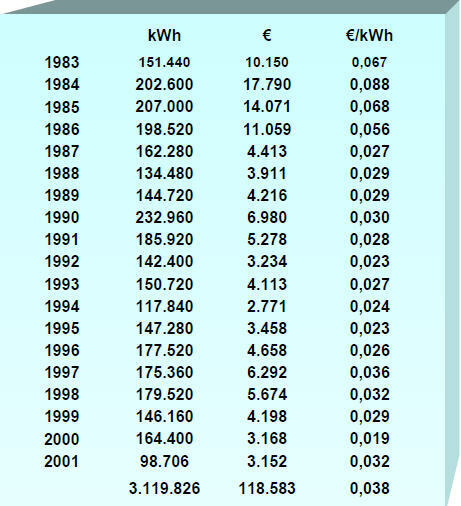 There are even times, when no compensation is made at all, but during a heat wave in the summer of 2001 the power rate exploded at one stage to € 1.11/kWh!, which lasted for a few hours. Unfortunately little water was available during this short period, but these peak hours produced half the monthly income. 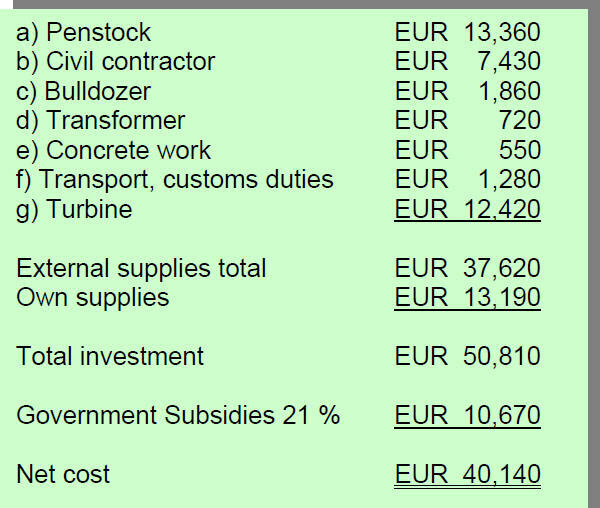 The best power generation year yielded € 17,789, but tariffs were most favourable then and Bruce’s home was not yet connected to the hydro at this time, so all energy production could be sold. Up to now, the year 2001 has been the most disappointing one regarding income, due to low energy production and low tariff rates. Apart from income taxes (at a reduced rate), Sloat points out the required routine maintenance work, which are minimal and the daily rake cleaning work of the trash rack on the turbine intake in autumn (and the collected leaves and other organic material is worth collecting for composting). Even during an extended absence of six months, no problems were reported. During this time, a neighbour, who also owns and operates an OSSBERGER turbine, kept an eye on his plant. To further automate his plant, Sloat hooked-up a telephone modem, which permits him to monitor various key plant parameters, such as output, voltage, etc., from any phone around the world. Once per year a major inspection is necessary. 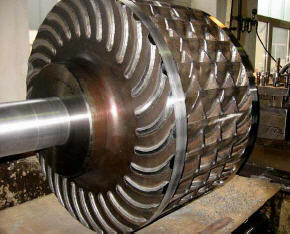 This comprises cleaning the electric relays and changing of bearing grease. This takes around 6 hours. Recently one of the turbine bearings had to be changed, but since this bearing is a standard design, a local dealer had it in stock. 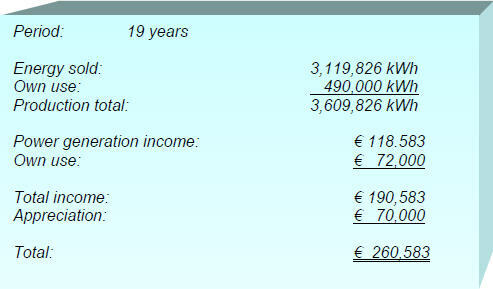 During 19 years of permanent operation the total costs of maintenance and spare parts amounted to approximately € 30,000. This amount would have to be deducted from the totals listed above. Irrespective of the project size, investment in hydropower is rewarding. his investment plan was well timed. Bearing in mind the politics of energy – similar benefits can be expected for many years to come. Regarding the quality of the equipment to be implemented in your project, please see the paper named “Aspen Revisited“. This paper can be found on the Water21 website. Guaranteed efficiency values which are pre-requisites for a profitable return of your investment. To achieve such low-maintenance operation, the original OSSBERGER™ Turbine is equipped with maintenance-free guide vane bearings. Efficiency tests were conducted at many stations owned by large Utility companies, which verified that our stated efficiency claims were not only achieved but in some cases even exceeded. 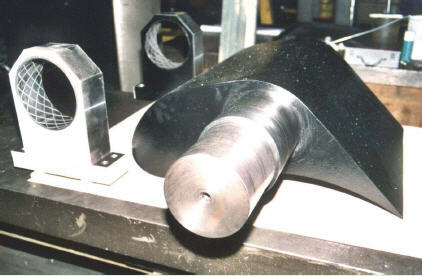 You are probably familiar with complaints and efficiency shortfalls of other Cross-Flow Turbine Imitators, which should not be overlooked; along with the extreme operating longevity of OSSBERGER™ over other makes. Fig. 9:Efficiency measurement at Alsjö hydro station – all test points are within the guaranteed efficiency band. investor. An investor with a 20 kW unit desires the same reliability as owners of larger OSSBERGER power stations. Of course, I could have reported on power plants with 1000 kW output, which are running at a mere 40 kW during the low-flow season. But I’m sure, you will know such facts which are to be expected from our turbines. Irrespective of installed capacity and invested amount, each project should be approached with the same diligence, care of details and the high demand for a modest technical concept. These are my main reasons for presenting you Sunny Brook Hydro, instead of a new 2 MW turbine. What has been achieved for mini hydro can be realised for larger plants at even lower specific costs. Thank you for your kind attention and I shall gladly be at your disposal for any further explanations.